Norton 360 is an all-in-one security suite that provides real-time notification and protection against viruses, bots, malware, Trojans, spyware and other threats. The new Symantec Norton 360 version 4.0 can automatically tunes the computer to clean and repair the registry, remove unnecessary files, defragment hard drive, and optimize PC to keep it performing quickly and efficiently. In addition, the program also able to automated backup and restores files locally or to a secure online storage service. Furthermore, Norton 360 has improved Norton Intelligence-driven technology and Norton Safe Web technology to stops Internet threats. Real-time SONAR technology detects emerging spyware and viruses before traditional definitions are available. Recovery tool helps to find, salvage, or otherwise retrieve lost files. 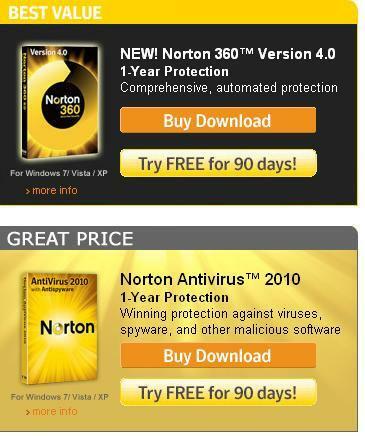 Note: The same promo page also provides free 90 days trial of Norton AntiVirus 2011. 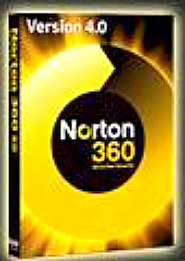 Norton 360 Version 4.0 supports Windows 2000, Windows XP, Windows Vista, and Windows 7 (32-bit or 64-bit). Check out more free anti-virus product offers available.